Korg Family of Products advertisement including the ES-50, Delta, Sigma, M500 Micro Preset, MS-10, MS-20, MS-50 and Trident synthesizers, CX-3 and BX-3 organs, LP-10 electric piano, KR-55 and KR-33 drum machines, SE-300 and SE-500 Stage Echo effects units, and X-911 guitar synthesizer from page 42 and 43 in Keyboard Magazine January 1982. Also included some tuners - meh. And so the Korg love continues! 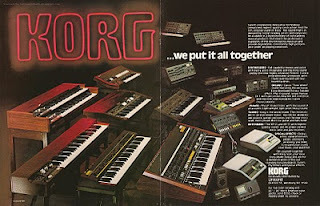 It had been quite a while since Korg had summarized their keyboard and drum machine offerings in a single ad. Oh yeah... Um... Never. They had previously smooshed a couple of different instruments together in smaller ads, but I can't recall anything like this. Readers had the relatively rare privilege of viewing this ad in the January, February and June 1982 issues. And it was about time it showed up. Competitor ARP had turned the "product family" photo ad into an art form back in 1976. Oberheim had also featured a family photo ad back in 1976, and Roland in 1978. And Sequential Circuits Inc. was about to join the family photo party with their ad starting in February of the same year this ad showed up. It was also about time because for the previous few years, Korg and been pushing a lot of different products in Keyboard, sometimes three or four ads in an issue. A reader could easily get overwhelmed by it all. 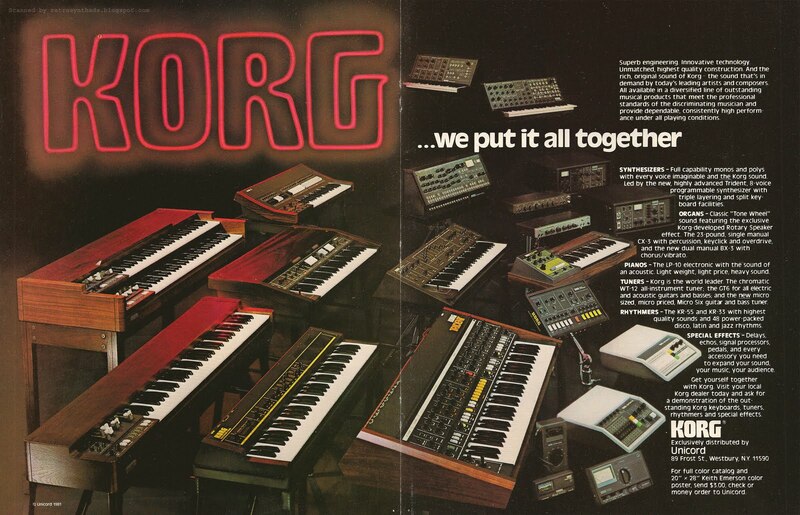 So, by putting "it all together" into a single ad, Korg helped readers wrap their heads around everything available in a nicely laid out 2-page package, while at the same time pounding their chests a little at some of their competitors. Korg big! Korg smash! The collection of synthesizers Korg brought together for this ad is nothing but spectacular. It's definitely not every piece of gear Korg had on offer. But it's a good summary. And including products like the MS-20 or Sigma, gear that hadn't been advertised for over a year or two, were nice gentle reminders to readers that these instruments were indeed still available in 1982. For readers today, it provides a perfect summary snapshot in time. A great historical resource. The design of the ad is a little chaotic. "Korg" in bright neon-red may almost be too big, and to me, looks like it is pushing what was once a nicely lined-up set of instruments into the column of text. Maybe that was the intent, but it makes reading the ad-copy a little more difficult than it should be. And that poor MS-10 in the upper-middle of the ad facing the wrong direction. What's going on there? It's like it never got the memo. But those small small criticisms aside (from the guy, almost 30 years later, with 20/20 hindsight) just makes me love this ad even more. The most interesting reference from this ad is right at the bottom: Get a full color catalog and 20" x 28" Keith Emerson color poster for three bucks. Good to see Korg take a page out of ARP's playbook and throwing a bit of name-dropping into their ads.